Jack Webb (1920-1982) was a popular American actor, television producer, director, and screenwriter. He started out in the entertainment industry in comedy but achieved his first success playing the title character in the radio show Pat Novak, for Hire. His greater success came from his role as Los Angeles Police Department sergeant Joe Friday in the show Dragnet, which he created based on actual LAPD criminal case files and which ran for many years on both radio and television. 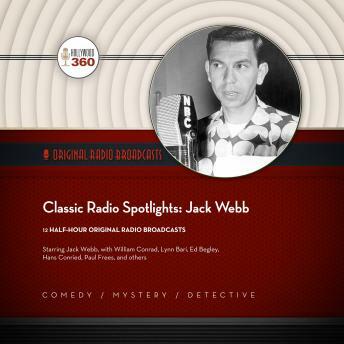 This classic radio collection spotlights Jack Webb in episodes from a variety of series from the golden age of radio.